With a critical eye that mirrors his subject’s, Todd Rendleman explores the values, temperament, character, and style that have made Roger Ebert the most trusted and influential film critic in America. Introducing the one critic whom so many moviegoers recognize, argue with, and love, Rule of Thumb illuminates Ebert’s critical strengths and blind spots. His sensibilities are further appreciated through comparisons to incisive, provocative colleagues like Pauline Kael and John Simon. While exploring their critical clashes, the author offers fresh assessments of a host of movies, from modern classics like Last Tango in Paris and Blue Velvet, to films that deserve another glance, like Music Box, In Dreams, and Bliss. Few are in a position to write a firsthand memoir of one of the world’s great film critics, but Rendleman accomplishes just this, smartly intertwining his own coming-of-age cinematic sensibility with a witty critical analysis of his subject. All told, his achievement is noteworthy: he offers a unique view of a celebrated personality, while revealing himself as a writer of insight and dash. Todd Rendleman is Professor of Communication Studies at Seattle Pacific University, where he teaches film art, history, and criticism. He lives in Seattle, Washington. "Cheerfulness and generosity-even overgenerosity-aren't qualities we often associate with good film critics, but they characterize the long and productive career of Roger Ebert, and they also mark Todd Rendleman's ardent reading of his work. Rendleman pays Ebert the biggest compliment a moviegoer can give a critic: he can't get enough of him-and he wants to keep arguing with him, long after everybody else has gone to bed." 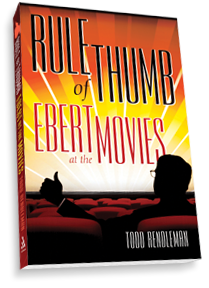 "Todd Rendleman's is the first book to survey Roger Ebert's vast impact on how movies are made and watched in America. Flashing backward and forward through Ebert's life and writings, Rendleman traces how Ebert's Midwestern ethos positioned him between Hollywood flackery and the New York intelligentsia, giving him a distinctively personal voice. In the process Rendleman dramatizes how Ebert responded to trends in American media culture--the challenges of daily reviewing, the pressures of celebrity, and not least, the dominating role of Pauline Kael. The result is an energetic, highly personal tribute to our most versatile film critic." "Todd Rendleman's book on Roger Ebert is a remarkable achievement—biography, cultural history, astute appreciation and analysis of the critic's methods and values, and on top of all that, a lovely read. Occasionally the author's tracing of the logic and references in an Ebert review takes on the narrative excitement and impulsion we encounter in the finest close readings of films. In one chapter, assessing their responses to the same movies, Rendleman's point-by-point comparisons of Ebert's critical persona and tone of mind with those of two other major voices, Pauline Kael and John Simon, yield fascinating working portraits of the strengths and limitations of all three. Perhaps the most surprising aspect of the book is its gentle but fervent assertion of a uniquely Illinoisan perspective on life and art, enhanced by the author's uninsistent marking of key moments in his own personal and cinematic itinerary as they sometimes parallel, sometimes intersect with Ebert's. It's a journey delightful to join." "Sharp and multi-faceted in its analysis, Rule of Thumb is an honorable appreciation of Roger Ebert as plainspoken, longstanding arbiter of what's good and bad in the movies. Full of earned insights and refreshingly free of jargon, the book's illuminating reading, not least because Rendleman underscores his subject's influence by interweaving personal reminiscences about coming of age in Illinois moviehouses with his fellow Heartlander's rise as film critic and cultural game-changer."